Just about 2 years and 9 months ago, Jeffery was given the amazing opportunity to become the father of his late husband's best friend's baby girl. 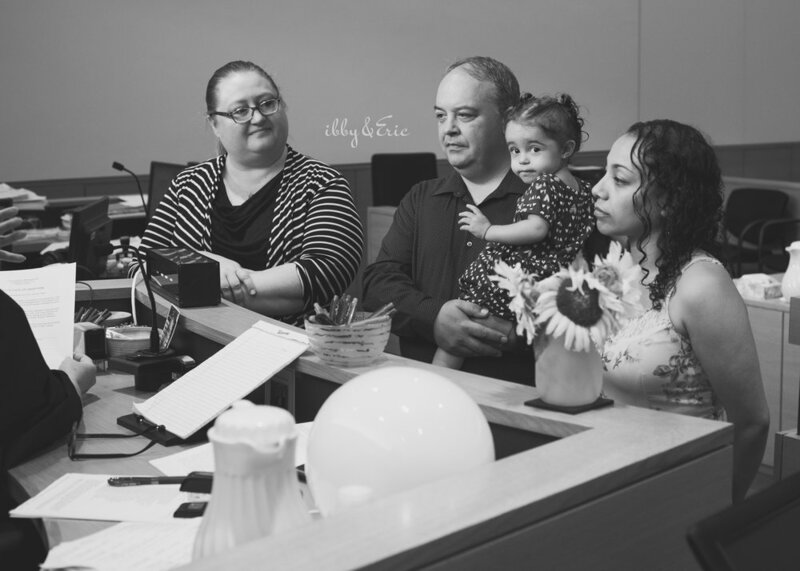 Jeffery has been Thea's dad since before Day 1— he's been to all of the doctors appointments with Zaida, he was in the delivery room when she was born, all the way up through her 2nd birthday last week—and now they're making it official in the eyes of the State of Massachusetts! 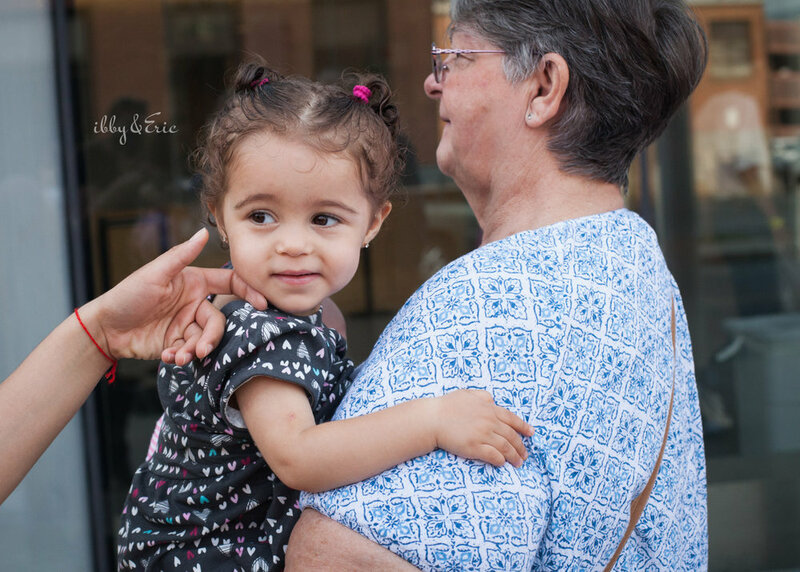 I met up with Jeffery, Zaida, their daughter Thea, and some of their family members outside of the Franklin County Superior Court in Greenfield last week to photograph their adoption ceremony. Turns out, getting camera gear through a courthouse security checkpoint is trickier than we had thought--even with a signed letter from a judge giving us permission! After a little bit of confusion at the security desk, another guard was called in and my camera bag was escorted into the courtroom (without me!). While we waited to be called in, the family kept joking with me about how weird it was to be without my gear! 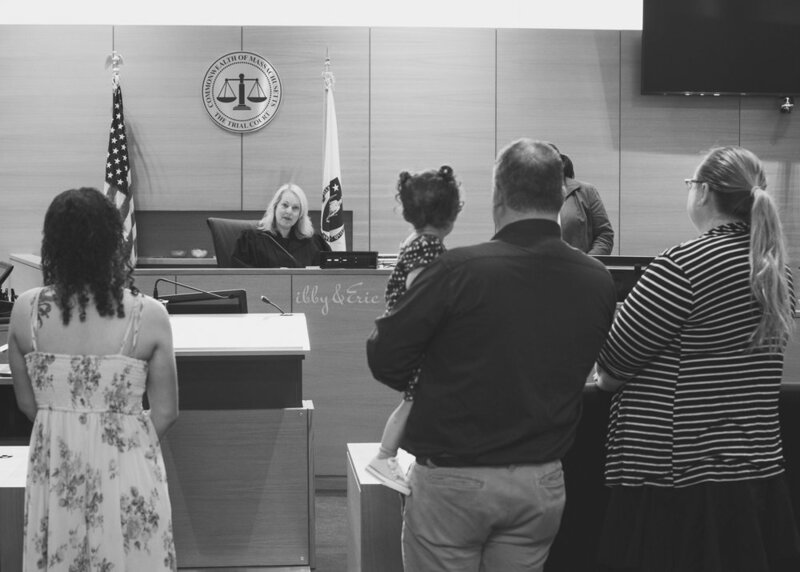 After all the legal documents were signed by the judge and both parents, the she invited the whole family up behind the bench for some photos. The judge complimented Thea on her pretty red bracelet. Then Zaida pointed out that she, Jeffery, and the whole family were wearing matching ones, too! She also gave Zaida & Jeffery the pen they used to sign all of the legal documents to keep as a memento of this special day. Now that the adoption has been finalized, lots of people have been asking him if he feels any different. His answer? "Do I feel different? No, there is no different feeling. She’s always been my daughter! ♥️"
The love this family has is incredible and so special. Congratulations Thea, your parents rock! ibby & Eric Photography, LLC. is a married team of photographers located in Massachusetts, specializing in weddings and lifestyle family photography.